Following our time at The Getty Center, my friend Eric Kunisawa and I drove east to the Los Feliz neighborhood of Los Angeles. 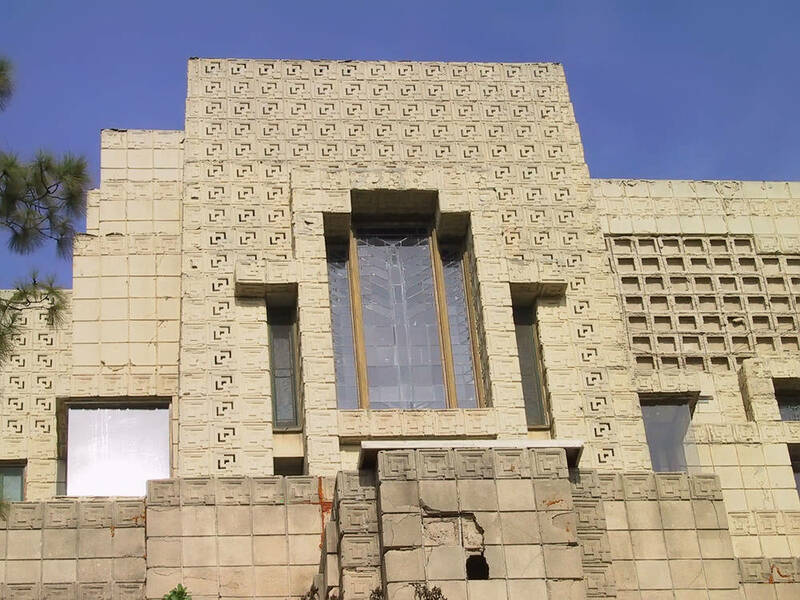 Our destination was the Frank Lloyd Wright-designed Ennis House. The photos that follow were shot by Eric that Sunday, Dec. 8, 2002. 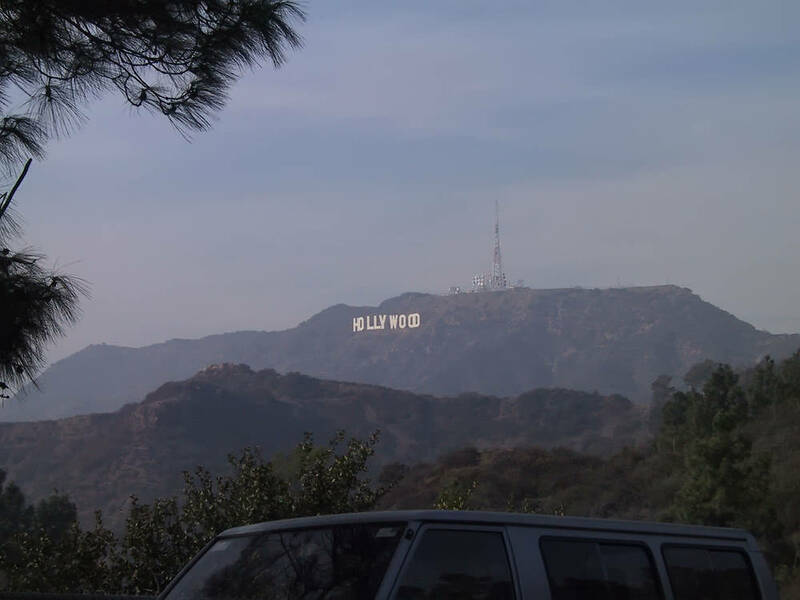 The Hollywood sign as seen from near the Griffith Park Observatory. In the late teens and early 1920s, Wright maintained an office in Los Angeles and was busy exploring designs using what he termed "textile blocks." 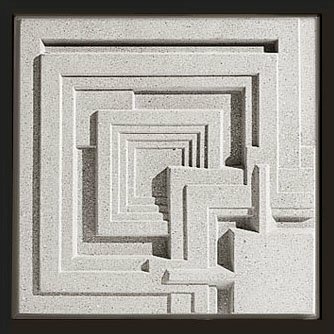 His idea was to take an inexpensive and mundane material (concrete) and cast it into ornamental blocks to create a "masonry fabric capable of great variety in architectural beauty." His hope was that this type of construction could be used for any project regardless of size or budget. 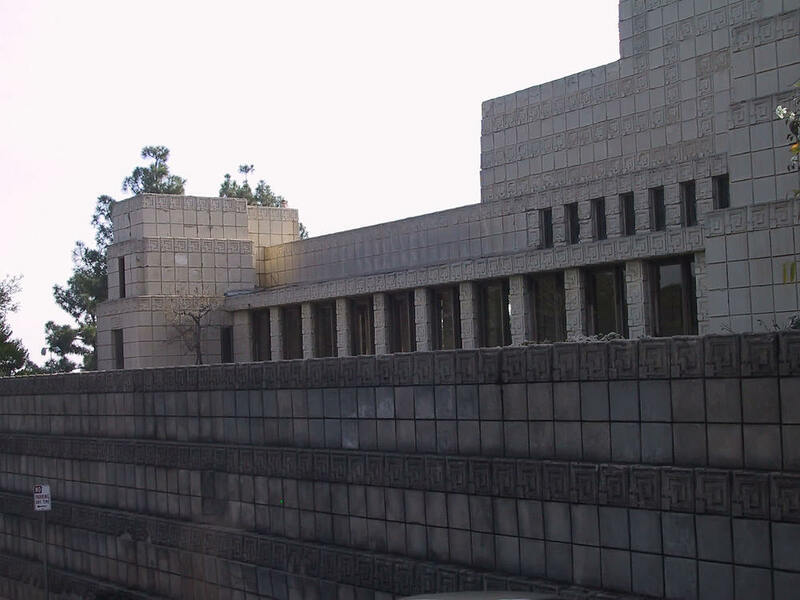 Although he designed a number of homes using this technique, ultimately only four were built: the Millard House, the Storer House, the Freeman House, and the last and largest of these, the Ennis House. 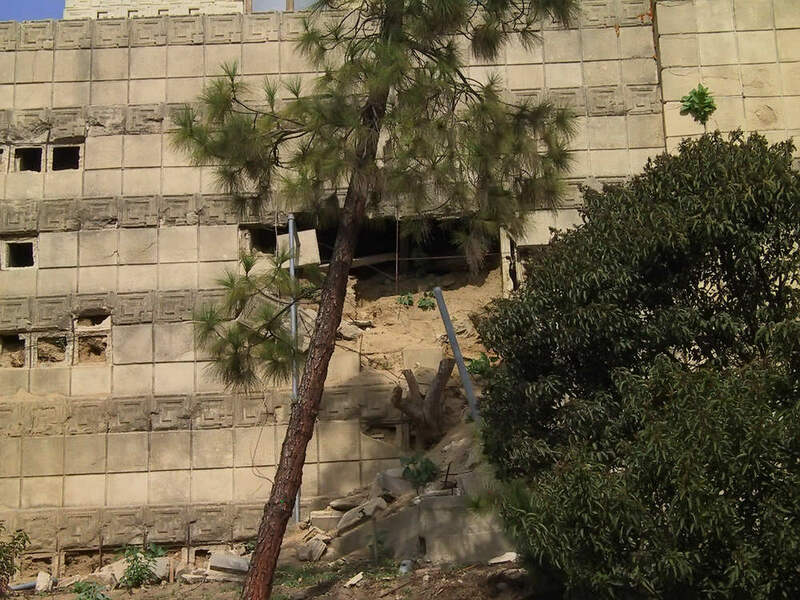 The Ennis House was originally designed for Charles and Mabel Ennis in 1923 and completed in 1924. However, due to disagreements with his clients, Wright left the project midway through construction. The owners then completed it, deviating from Wright's design in the process. Charles only lived a few years in the house before he died. A few years later, in 1936, Mabel sold it. In 1940, it was sold again, this time to movie producer John Nesbitt - who hired Wright to design several alterations including a ground floor billiard room, a heating system, and an in-ground pool on the north terrace. 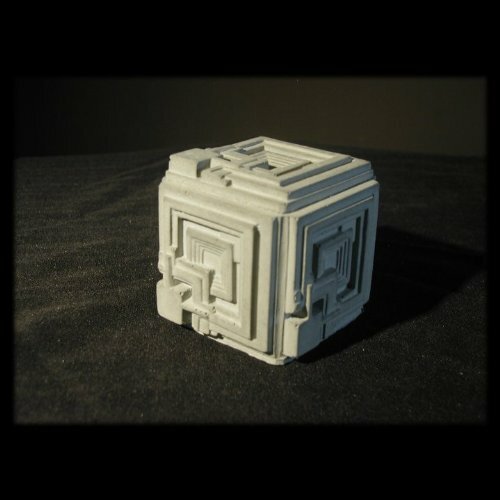 This block pattern is unique to the Ennis house. In addition to those alterations, Nesbitt had Wright suggest interior furnishings as well as new designs for the ceilings in the larger rooms. While some light fixtures and window sills were replaced at Wright's direction, the work on the ceilings was not undertaken. The house showing damaged sections. In 1968 the house was purchased by its eighth owner, Augustus O. Brown. Over the next decade, Brown maintained it and opened it for tours. 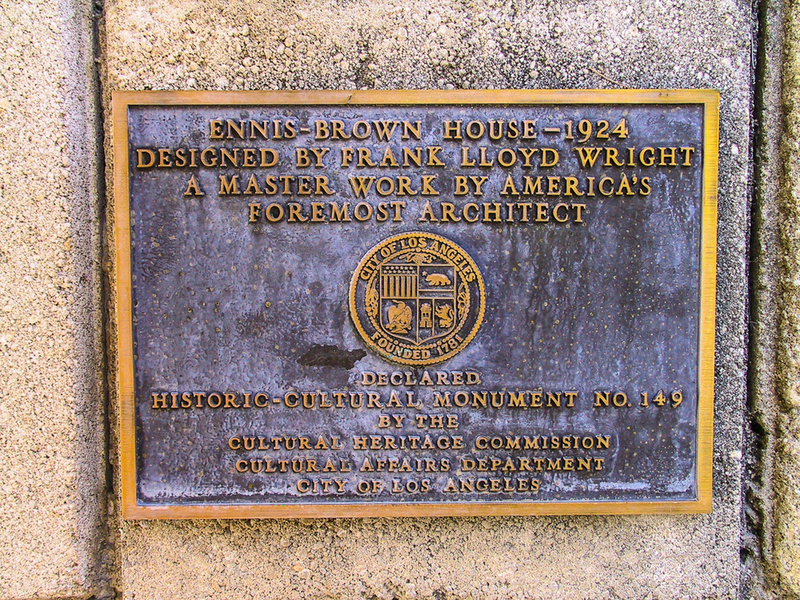 He ultimately donated it to the public in 1980 and it was re-named the Ennis-Brown House in his honor. By this time the house was showing signs of decay. In actual fact, structural problems had begun during its original construction when blocks had cracked and portions of walls had developed bulges. When the blocks were initially cast, decomposed granite from the site had been added in to the mix to color it. It was later determined that doing so had introduced natural impurities that, combined with the air pollution, accelerated their natural decay. Damage on the the main retaining wall. 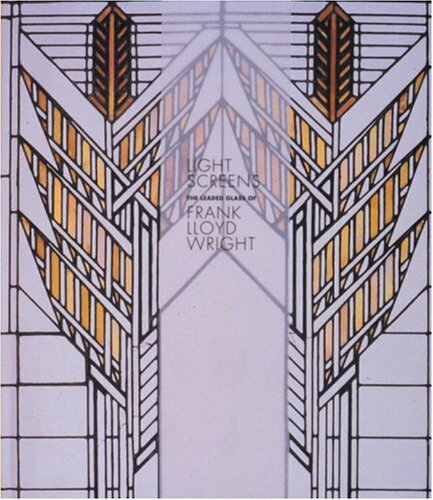 The windows - while striking - are not Wright's original design. A section of blocks awaits replacement. The 1994 Northridge earthquake further weakened the structure, as did record precipitation during the 2004-2005 rainy season. However, during this time, funds were being raised to save the home and celebrity architecture buffs such as Diane Keaton helped raised awareness. In 2006, a FEMA grant allowed restoration work to begin. Wright's grandson Eric Lloyd Wright, himself an architect, consulted on the project. Eric's father Lloyd (Frank's son and also an architect), had supervised the original construction (Diane Keaton has owned several Lloyd Wright homes through the years). Now stabilized, the home - which had reverted to its original name - was sold in 2011 to billionaire Ron Burkle for close to $4.5 million - roughly 30% of its original asking price. Burkle has pledged to continue restoration efforts as well as to provide access to the public no less than twelve days per year. 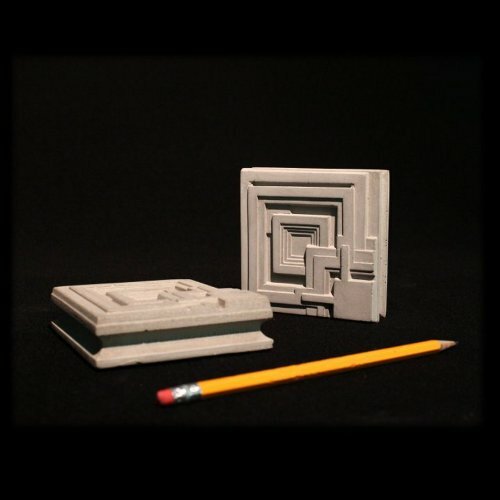 While I had studied Frank Lloyd Wright in college and read about the history of the Ennis house at that time, I had actually been exposed to the home number of times before. The first time was very likely the Ridley Scott film, BLADERUNNER. In it, the house served as inspiration for the design of the Harrison Ford character's apartment. While the apartment was itself a constructed set on a soundstage, you can clearly see the Ennis block design repeated on its walls. Ridely returned to the house for 1989's BLACK RAIN, where the home doubled as a Yakuza stronghold. In 1991, I saw it twice on film: first in GRAND CANYON and then in THE ROCKETEER as the home of the villain played by Timothy Dalton. At the time, I thought his scenes had been shot within the actual house, but I've since learned that, like BLADERUNNER, they were shot on a set built on a soundstage to resemble the house. If you watch the film, you might notice that it has a second story above the living room, when the actual house does not. As it turns out, the home has been used extensively over years as a location for movies & TV shows. Its resumé lists everything from the original THE HOUSE ON HAUNTED HILL to television's Buffy The Vampire Slayer. It has also been used as a location for photoshoots. 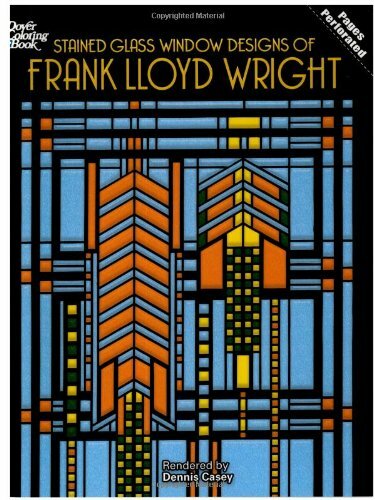 While the Ennis House appears in quite a few books about Frank Lloyd Wright, I know of only one publication devoted entirely to it. Unfortunately, that title - a thin, paperback, brochure type of thing - is long out of print and out of stock at amazon (and quite expensive via their affiliates). 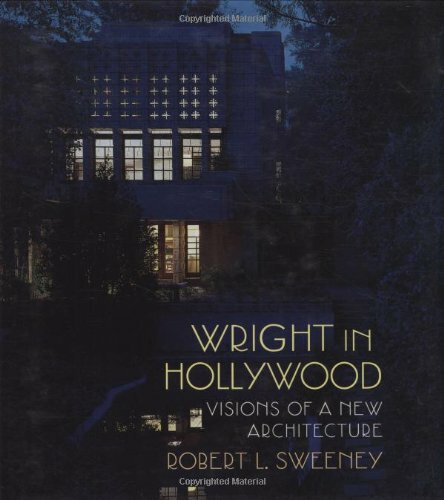 However, the more recent Wright In Hollywood is an excellent account of this period in Wright's career and covers all four of the "textile block" homes that were built, as well as a few that weren't. Two other titles appear to be out of print, but can be had via Amazon's third party resellers. 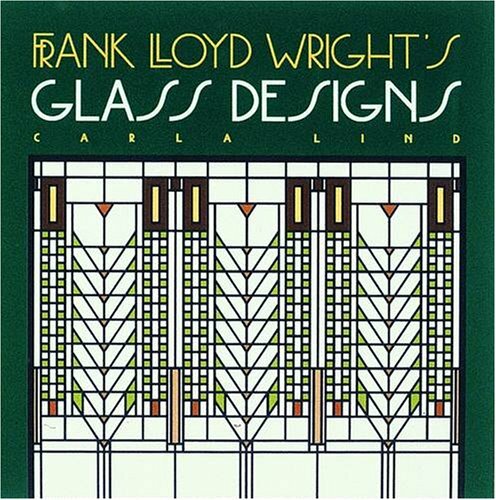 Californian Textile Block: Frank Lloyd Wright at a Glance is similar to Wright In Hollywood though smaller and much more succinct. It discusses all four of the built "textile" homes and includes the Barnsdale home (a.k.a. Hollyhock House) as well. 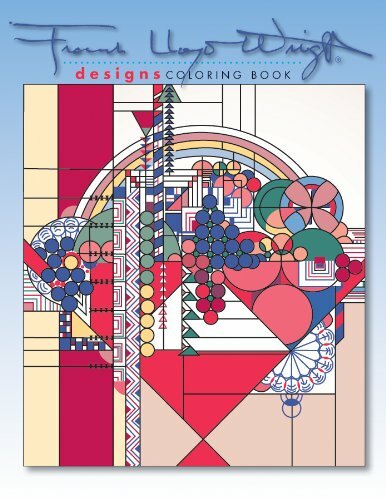 The Wright Space: Pattern and Meaning in Frank Lloyd Wright's Houses looks at the way Wright designed his homes. It includes a chapter on his California homes with a spatial analysis of the Ennis house. 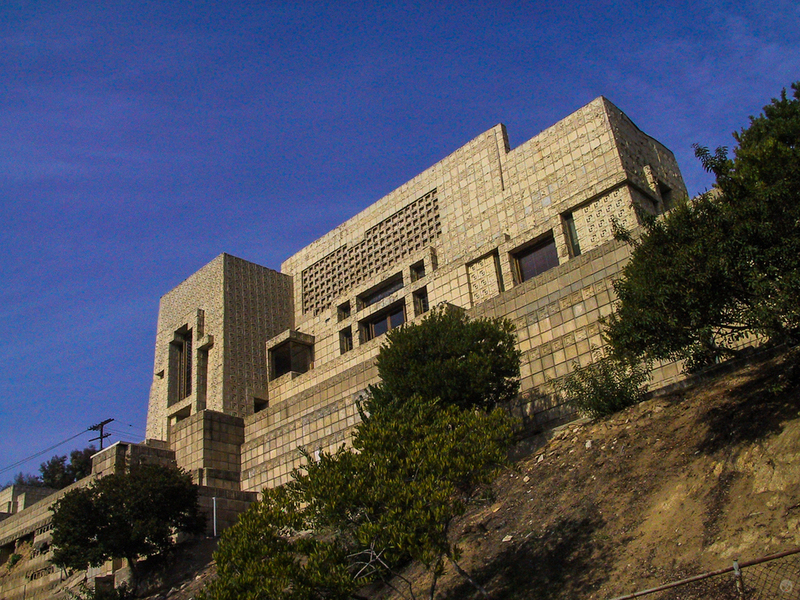 The Ennis house was among the last of Wright's work to feature art glass windows. 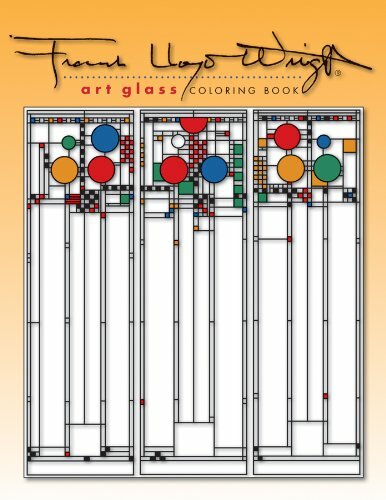 Although, the windows we see in the house today weren't designed by him (they were among the original owners' design revisions after Wright left the job), they've long been a favorite of mine - possibly tied with those of the Robie House for second place. My favorites are those of the Barnsdale (aka "Hollyhock") House - a mile or so south of the Ennis House in Los Angeles. 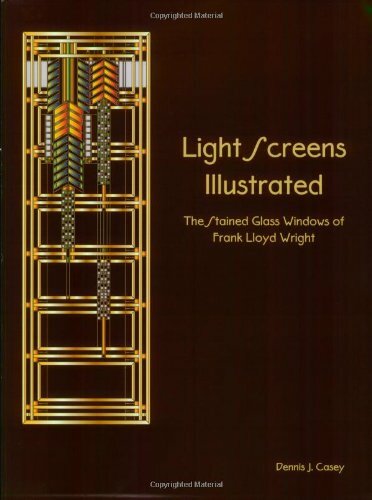 Light Screens: The Leaded Glass Of Frank Lloyd Wright, by Julie Sloan, is an excellent survey of the various designs he used throughout his career. There are also several other titles that cover this subject, though they are not nearly as comprehensive about it.